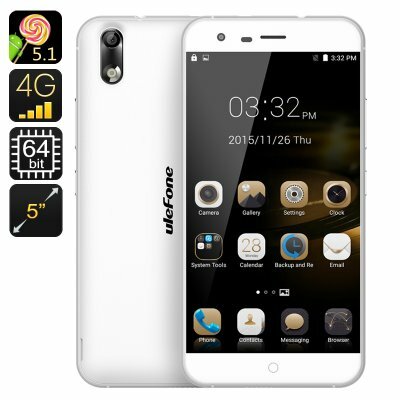 Successfully Added Ulefone Paris X 4G Smartphone - 5 Inch HD IPS Screen, Android 5.1, MTK6735P 64-bit Quad Core CPU (White) to your Shopping Cart. The Ulefone Paris X smartphone has a beautiful thin-bezel design with great functionality and connectivity. Watch movies on the 5 inch HD display, play the latest games with Mali-T720 GPU while enjoying the latest Android 5.1. The Ulefone Paris X is a skillfully-crafted device with a large 5 inch screen, thin bezels and friendly interface. You will have a beautiful HD display with a 2.5D curve at your service - perfect for watching videos and browsing the web. The quad core MTK6735P 64-bit CPU will ensure smooth operation and enable multitasking. Moreover, you will have all the super powers of Mali-T720 GPU at your service for gaming. With Smart Wake and Gesture Sensing, you will get great shortcuts when navigating the device: “drawing” a letter on the screen will bring up the app you need and a simple wave of the hand will let you skip a track or move from one photo to the other. With the latest Android 5.1 operating system, you will have access to everything the Play Store has to offer. So, feel free to load up on games and tools. The Ulefone Paris X comes with 16GB of internal memory – and you can expand that further by adding a 64GB micro SD card. The smartphone comes with two SIM cards and boast great connectivity, including the support of 4G networks. With a 2150mAh battery, you will have up to 2 hours of non-stop usage time + 72 hours on standby. The Ulefone Paris X Smartphone comes with a 12 months warranty, brought to you by the leader in electronic devices as well as wholesale Android Phones..